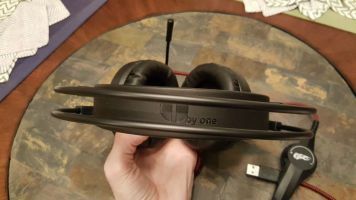 1byone enters the gaming headphone fray with an impressive sounding pair of virtual 7.1 surround headphones. 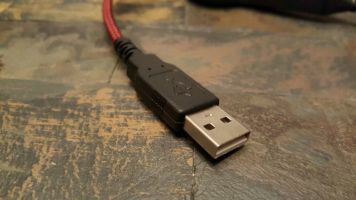 There are a bunch of gaming headsets out there that all do the same thing or have similar features and there are some that don’t have the same features to distinguish themselves against the other competition. That’s not to say 1byone hasn’t got what it takes to keep up with others out there as they did a really good job with this gaming headset. 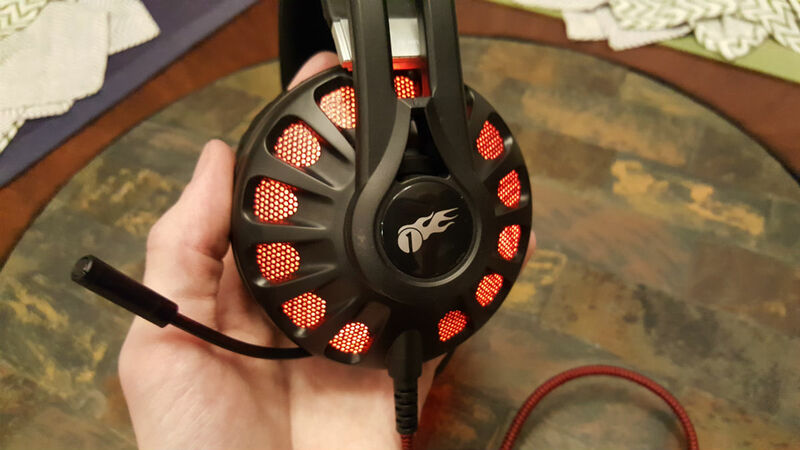 Let’s take a look at how 1byone’s virtual 7.1 gaming headset does in this review. Almost any gaming headset you see these days is going to be bulky and more obnoxious (flashy) than it needs to be, and 1byone joined in on the trend. 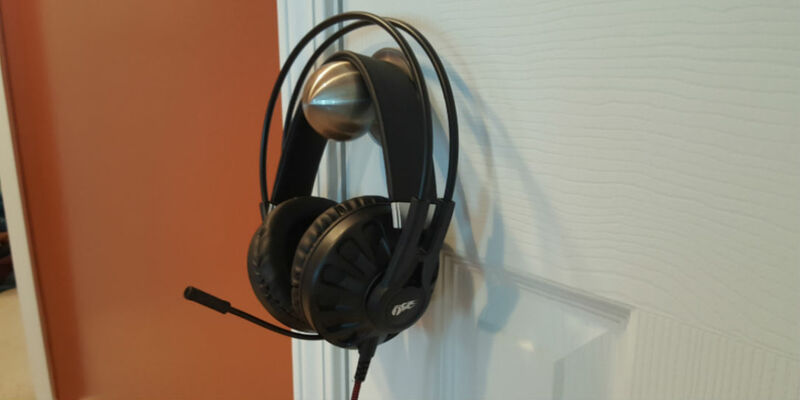 It’s not a bad thing, but not everyone is going to want a giant headset on their head when gaming. The design isn’t too bad if I might add. It is different than what I personally do see others using. A headset with square-ish rectangular over the head design. On top are two rails attached to the headset essentially holding the ear pieces and the headband connecting to each side of the rails. 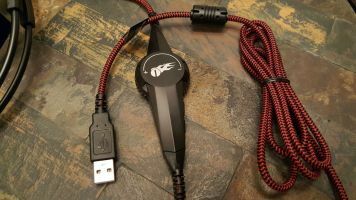 The headband does adjust on its own without you needing to raise or lower the band as you would for other headphones out these days. 1byone’s logo is also on top of the headband. As for the earcups you’ll see a number one with a flame following it which is a pretty cool picture, but both of the earcups are circular and light up red thanks to the LEDs behind the net shaped design when plugged in. The microphone retracts from the left side of the headset and doesn’t come out too far. The tip of the microphone does light up red which is also pretty neat. Following the cord that just so happens to be black and red much like the gaming headset, a little ways down you’ll notice a volume control. The wheel inside the piece lets you easily raise or lower the volume at any point in time. 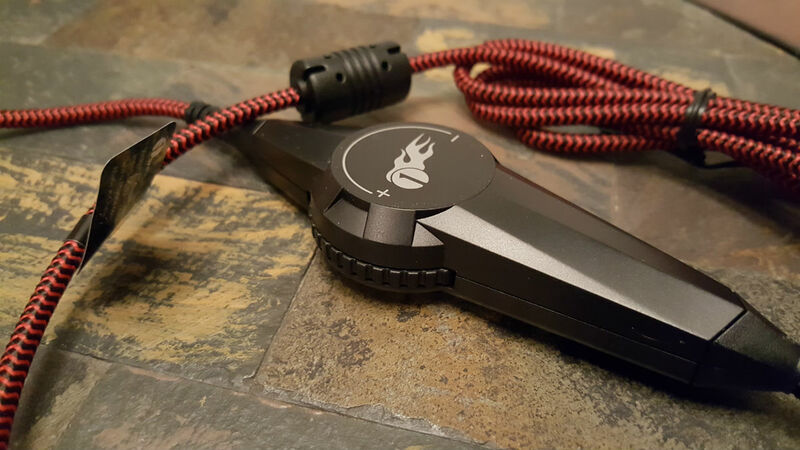 There is also a mic button allowing you to turn it on or off and a light on/off button, and at the end of the cord is a USB port. 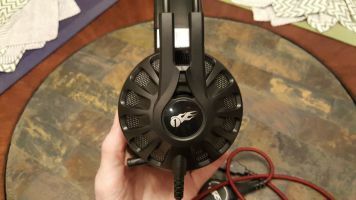 I’ve used many headphones in my life and one gaming headset for the Lenovo Y700 ideacentre and I thought those were really really good on sound quality. Then I received these from 1byone. Let me tell you that I don’t think I could even begin to try out another gaming headset whether it’s virtual 7.1 or not. Sure, with this gaming headset being the second one I’ve ever used, 1byone set the bar pretty high and it can probably be matched or beat, but right now, 1byone did a nice job with sound quality on this headset. Every song I listened to while not playing games, or when playing games the sound was nice. You will have the ability to adjust the volume settings thanks to an installation disk for control in case you don’t want volume going or your mic going over a certain limit. You can also edit the sound coming from the headset too. 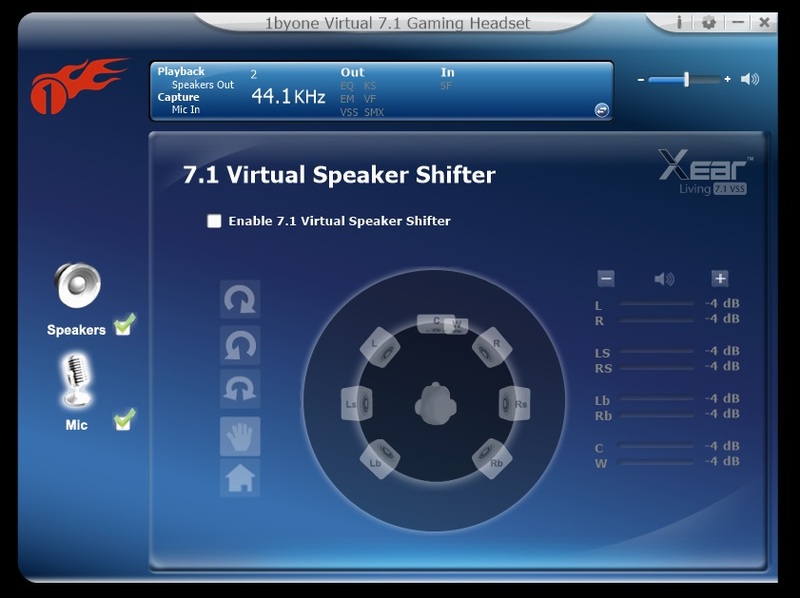 There’s the option to set an equalizer, set volume control, environmental effects, 7.1 Virtual Speaker Shifter, Xear SoundFX, and Xear Surround Max. The last two I did not try as I didn’t have a need to mess with them. My two favorites were the 7.1 Virtual Speaker Shifter and the environmental effects. With the speaker shifter, you have the ability to rotate the sound clockwise/counterclockwise, have a manual rotation, or even raise or lower the dB on specific areas of the headphones. So, if you wanted it to be louder on the side left and right left, you can move it manually instead of having all sides get louder. 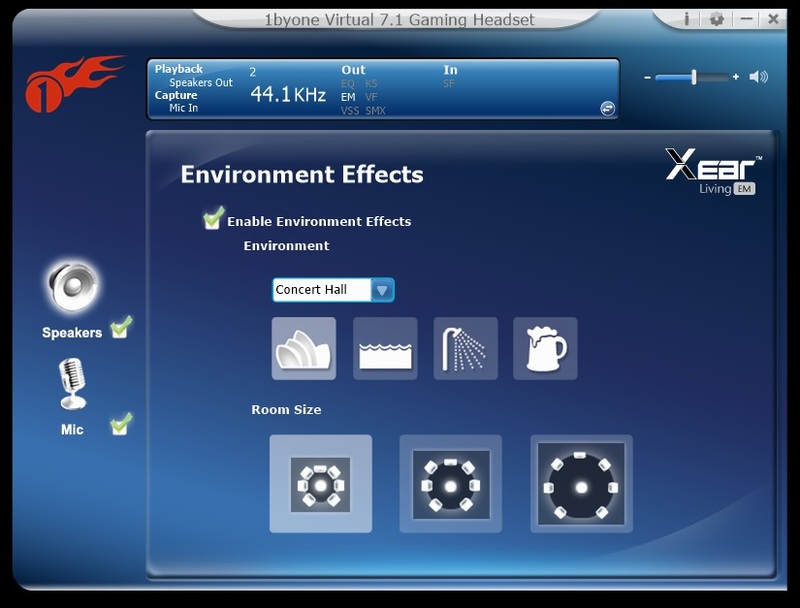 As for the environmental effect, you can choose a specific environment such as generic (default), concert hall, underwater, bathroom, psychotic, living room, forest, and more. If you want to choose the room size, it’ll change how the sound is produced. Choosing the “small room” will essentially have the music seem much closer to you. It’s hard to generally explain, so you’ll just have to purchase a pair to find out. I didn’t use the mic when playing online games because I don’t feel the need to speak with anyone else, but when I tried a few Skype calls, the person on the other end was able to hear me just fine. That was even without adjusting the settings for the mic. I left that as is just in case I messed it up. 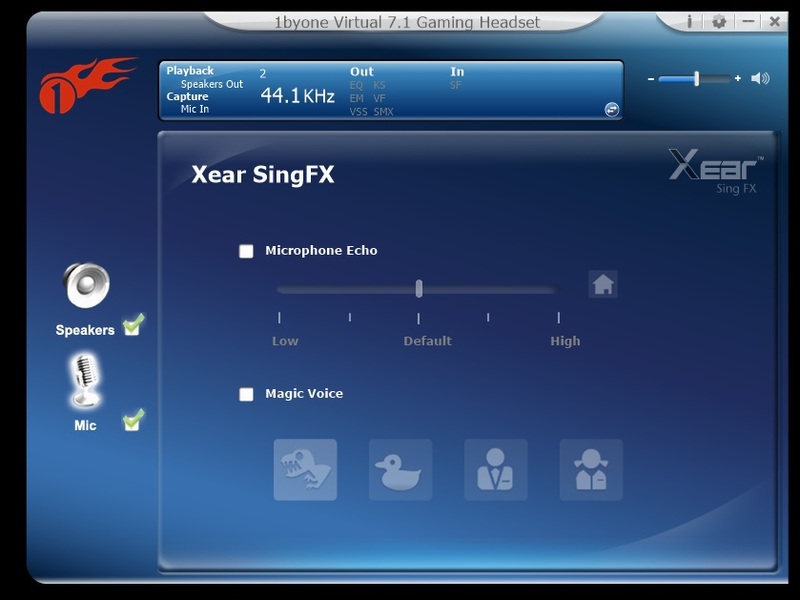 When going through the settings for the mic, you have your basic volume control, Xear SingFX, and a microphone boost which is turned on by default. 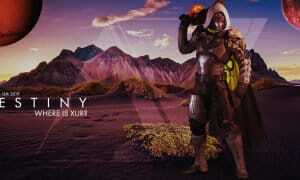 The Xear SingFX was funny. You can change your voice to a male or female, or have your microphone echo. I’m not a big PC/Mac gamer, so headphones don’t really appeal to me that much, but for the price of $50, I don’t think you’ll find another 7.1 virtual gaming headset for that inexpensive price. It may be possible, but for this price, it can’t be beat. 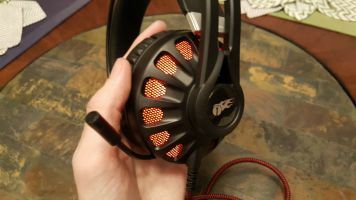 No doubt I’ll be recommending these gaming headsets as they’re really good when it comes to sound and price, but unfortunately they are a little too big for my liking. Regardless, 1byone did an awesome job on this gaming headset. Sound quality is truly amazing and the price is inexpensive. Design was a little too much, but expected with gaming headsets. 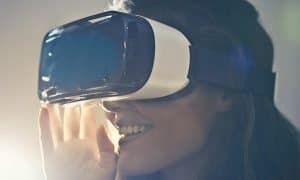 1byone goes up against the competition by coming out with their own pair of 7.1 virtual headset that gives you full control over volume and mic. *We were sent a review sample of the 1byone Virtual 7.1 Gaming Headset for the purposes of this review.